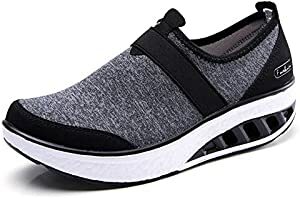 Sweepstakes: ZYEN Women Comfortable Walking Shoes Fashion Slip On Sneakers… | FreebieOrBust Freebies! Take a shot at winning your favorite item – you never know when you could win big. It all starts with action – Sign up and register for the chance to win today! Take action on your dreams and register right now. ZYEN Women Comfortable Walking Shoes Fashion Slip On Sneakers Platform Wedge Loafers Shoes Black 7.5 US, SZ7697heise38. The odds of you winning are 1:1300. Total prizes: 1. Sweepstakes hosted by Amazon and ZYEN Global Shop. We wish you the best of luck in your sweepstakes entry. Enter as many sweepstakes as you like, and the chances are that lady luck will smile down on you with good fortune.